(BRYSON CITY, NC) – Following a concert held in their Bryson City taproom on Saturday, August 21st, Nantahala Brewing Company brewed a beer with friend, and rising country music star, Jamie Kent. The musician joined Nantahala Head Brewer, Greg Geiger, in the brewhouse on Sunday, August 22nd to collaborate with the brewery staff and create All American Mutt, an amber style ale that shares its namesake with Kent’s soon-to-be released album. All American Mutt will be the first release in the brewery’s newest series, Music On Tap. The company’s partnership with Kent began four years ago when the young artist travelled through Bryson City on his way from Massachusetts, his then home, to Austin, for South by Southwest. The brewery invited Kent to play in their taproom and a friendship was born. Since that time Jamie’s career has grown enormously with his newest single featured in Rolling Stone Magazine, and his tour including stints with artists such as Huey Lewis & The News and The Doobie Bros. 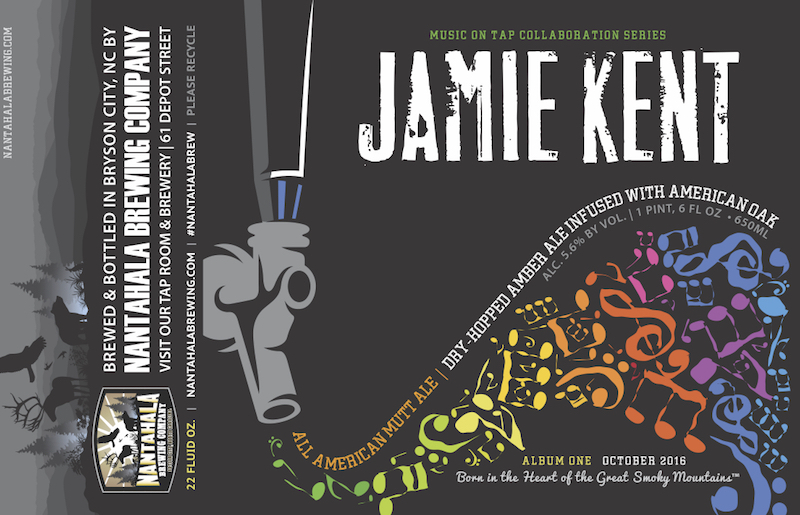 Despite his busy tour schedule, Jamie took time to reconnect with the brewery, and brew the collaboration. Nantahala Brewing Company created the Music On Tap series to reflect the owners’ passion for music.The brewery hosts 75 musical acts each year during their peak visitor season of April to October. Additionally, the brewery plans to build a large outdoor venue adjacent to the restaurant brewery on their newly acquired four acre property. All American Mutt was brewed with 150 pounds of local Riverbend Malt House Wheat, Heritage Grains and Two-Row. Post fermentation, the balanced ale was aged on Tennessee Whiskey barrel staves, adding soft notes of vanilla and tannins. Hop-forward on the nose but balanced on that palate, this amber colored beer combines a variety of flavors and ingredients, all American in origin, with some ingredients local to both North Carolina and Tennessee. The beer’s official release will take place in Nashville, TN on October 19th and will be released in the Bryson City taproom October 29th. This specialty beer will see limited distribution in Western North Carolina and Tennessee.